Something to Restore Your Faith in the Human Capacity to do Good. After the horror of Gadhimai and not forgetting of course the continuing exploitation, torture and barbarity of the factory farming system and the killing of billions of sentient beings in abattoirs and other abuses to animals, it’s time perhaps to focus on something positive and renew our often dwindling faith in the human capacity for so much good. Please now watch the very moving videos below. Despite the overwhelming cruelty that seems to pervade the entire world there are millions of people who condemn the rampant abuse and exploitation of animals that we are presented with day after day. I have more visits, likes and comments for blog entries concerning animals than I have for any other issue. So yes there are overwhelming numbers of people who love animals and most people wouldn’t deliberately harm another creature. It’s the minority that are involved in harming other animals and that has to stop, but today lets focus on the good that we do. Warning: You might want to have a box of tissues handy! Check out the following video from Animals Australia which shows acts of kindness towards ducks sometimes with the possibility of personal risk. In Memory Of the Helpless Animals Sacrificed at the Gadhimai Festival. This Page may be updated over the next few days. One is dearest to God who has no enemies among the living beings, who is nonviolent to all creatures. Please spare a thought for the 50,000 animals who during 28th and the 29th November were brutally slain in the name of barbarity, primitive fear and greed. Never kill any animals even for the purpose of sacrifice. Non-violence is the greatest of all religions. I hold that, the more helpless a creature, the more entitled it is to the protection by man from the cruelty of man. 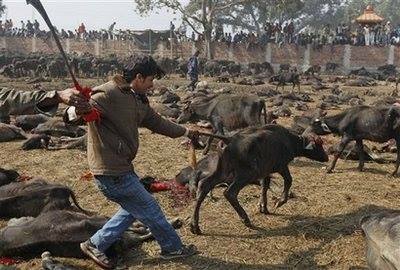 During November 28th and 29th 500,000 helpless animals were ritualistically and inhumanely slaughtered at the Gadhimahi festival in Nepal. Despite the best efforts of animal rights activists including Compassion in World farming , Animal Welfare Network Nepal, PETA , Jan Donovan’s Tweetstorm, Asia For Animals and countless thousands of people acting independently this hideous festival began during the early hours of Friday morning. It did not stop until all the animals are killed in the most hideous manner possible, sometimes hacked to pieces such as buffalo whose legs are cut from underneath them before beheading, often with a blunt weapon by an inexperienced person. As witnessed on one occassion in 2009 it can take as many as twenty attempts to sever the head, the suffering is unimaginable. It is said that the fields fill with blood. Participated in by over 2 million people including children this cruel spectacle lasted two days. “We are ready for the festival, everyone is in a celebratory mood,” said head priest Mangal Chaudhary at the slaughter site. Buffaloes were being coralled in holding pens for the festival devoted to Hindu goddess of power, Gadhimai, that sees hundreds of thousands of animals ranging from goats to rats butchered. Please take action let the Nepalese government know in no uncertain terms what you think and tell the rest of the world, so many people do not know that this atrocity takes place or that other animal sacrifices take place throughout Nepal. FRI 28th SAT 29th SUN 30th Report to the world this atrocity. Write E-mail and Letters – Tell government officials in no uncertain terms your outrage. Write E-mail or write letters but an immediate e-mail might be more effective during the festival. Occupy for animals say “Politeness can be omitted at this stage!!!”. My advice is, to say what you think in the strongest of terms but please avoid bad language, I don’t think abusive or bad language ever helps, though I understand the anger behind it, it gives them the higher ground. Also note the incongruity of President Dr. Yadav’s religion, Hinduism, with his actions in not only refusing to ban the massacre but allowing government subsidies to support the heinous event to the tune of over £32,000, which was the sum paid last time in 2009. Money that could be spent on more important things in this poor country, such as health care for example, rather than this sickening display of depravity. This event is about making money from superstitious dread, the exploitation of people’s fears, and most importantly appalling cruelly to defenceless animals. I find the whole thing is just so heartbreaking, I can hardly bear to think of the suffering of these innocent and helpless animals, and during the festival I thought of little else. I cannot understand the mentality of such a hideous and obviously cruel festival, such has no place in the modern world. It has no place in Hinduism, though the press and others refer to it as an Hindu festival it has in reality nothing whatsoever to do with mainstream modern Hinduism. Sadly as is the case in our world today it is the result of exploitation motivated by greed. Behind the facade of religious belief an insidious evil drives, exploits and distorts ancient beliefs. This evil comes in the form of the exploitation of superstitious dread, an innate fear that all human beings have to some extent. This inherent fear is promoted and encouraged by greedy priests to engender fear into the hearts of extremely poor people, to take from them what little they possess. It is difficult to associate such comments with our modern age of scientific and technological advancement, it is like taking a trip in a time machine to some dark primeval epoch. The festival is motivated by greed and superstitious fear as the following article clearly explains. BARA, NOV 29 – Goat prices in the city have almost doubled due to soaring demand for the Gadhimai festival that began Friday. While regular goat meat costs Rs 600 per kg, sellers have been charging as much as Rs 1,000 per kg for sacrificial goats. The Gadhimai festival is celebrated every five years with a mass sacrifice of goats and buffaloes, among other animals. A total of 125,000 goats have been sold from the Kalaiya Agriculture Market in the last three months for the Gadhimai festival. According to Saroj Kumar Shah, one of the main traders here, around 5,000 goats are being sold daily at the Haat Bazaar which takes place on Mondays and Fridays. Similarly, Nisha Kumari from Telkuwa said, “If we don’t offer goats to Goddess Gadhimai, she will be angry as we have pledged to make a sacrifice.” Gokul Sharma, who came to buy goats for the festival, said that they were costlier in Birgunj than in Kalaiya. These animals are not meat, they are sentient beings who have suffered a slow painful and horrifying death. The slaughter of more than 5,000 buffaloes at the Gadhimai Hindu festival in Nepal has drawn global condemnation from animal charities. To end the first day of the event, thousands of buffaloes enclosed in a compound surrounded by a high wall, are decapitated by a group of specially chosen men using curved kukri knives. On the first half of the two day event held in the jungles of Bara district, around 160 miles (100 miles) south of Katmandu, some 5,000 buffaloes were killed – and many are yet to be slaughtered. Shristi Singh Shrestha, an animal rights activist with Animal Welfare Network Nepal, told the newspaper she felt “sad” and “defeated” because the group was unable to stop the slaughter. “However, the positive thing is that the number of animals killed has come down … We hope there will be no killing of any animal at the next festival,” she said. Joanna Lumly speak passionately against the Gadhimai festival. About 2.5 million devotees have turned out for the festival, according to local government official Yogendra Prasad Dulal, who said it was ‘impossible to estimate’ the total number of animals sacrificed so far. On the first day, worshippers slaughtered more than 6,000 buffaloes, which were coralled into holding pens in the fields, along with at least 100,000 goats and other animals, Chaudhary said. The festivities will continue on Saturday when at least another 100,000 animals will die in the name of goddess Gadhimai. #Gadhimai Tweetstorm Reminder: WED 26th and THURS 27th = Storming attempt to trend and Other Last Ditch Actions. Apologies about so many posts on this issue, but it is a sad and shocking event which I hope we can change through persistent persuasion. Please help on WED 26th and THURS 27th = Storming attempt to trend. This is a reminder concerning the Gadhimai Tweetstorm. For more details click the link below which includes instructions on how to make the Tweetstorm effective, ideas, automatic and basic tweet sheets, lots of twitter addresses to send Tweets. Please help by tweeting as often as possible. It’s not to late to send on-line messages, sign petitions and send e-mail to Nepalese government officials – address details further down. Please be polite abusive language does nothing to help and hinders progress. 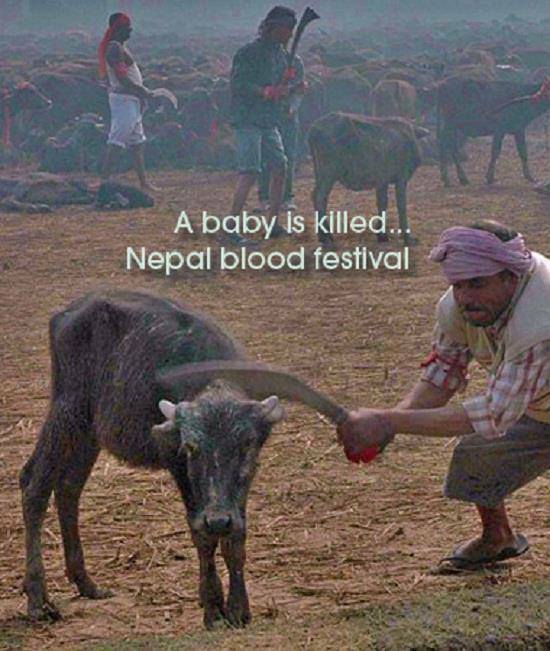 Please note that this festival has nothing to do with Mainstream Hinduism or the majority of the people of Nepal, many of whom are working towards ending the sacrifice of animals at this festival. Please take the following action from PETA and send an on-line message to the prime minister and the president of Nepal explaining why it is important to end animal sacrifices immediately. By filling out the form and clicking “send” you will be emailing this letter to 60 Nepalese Embassies Worldwide. This is a very simple form and takes only a moment or two to send a message, no editing is required. Automated web petition – you can edit this please try to use your own words or at least alter them but please send any way you can. http://embassy.goabroad.com/embassies-of/Nepal even if you signed the e-mail to 60 embassies above please consider sending a further message to your own embassy. Sample letters along with details of other actions can be found here in Compassion for world farming’s action pack. Please don’t be put off, send an e-mail even if your message is simply along the lines of “Please stop the sacrifice of helpless animals at the Gadhimai festival”. You might like to add a quote from Hindu scripture which clearly shows that the slaughter of animals is not a part of Hinduism. Suggested quotations appear at the bottom of the address list. Please note that this festival has nothing to do with Mainstream Hinduism. We need to remember that this isn’t a Hindu practice but rather a belief among a section of people. First let us address the accusation that this mass animal slaughter is the product of “Hinduism”. The Gadhimai festival is named after the local Nepalese Goddess Gadhimai. Gadhimai does not appear in the Vedas, the Ramayana, or the Gita, nor does she likely appear in any of the the Puranas. If Gadhimai does appear in any text it would likely be a Nepalese text written in their own local language. There are no universal Hindu festivals or doctrines, and the Gadhimai festival is not attended by or even condoned by most Hindus. Indeed, out of the more than 900 million Hindus on earth, only 5 million are said to attend the festival, that’s is only .005% of the population. Many Nepalese are against this festival. On Oct 11, Animal Welfare Nepal (AWN) orgainsed a rally in Kathmandu against animal sacrifice at Gadhimai Festival putting pressure on Nepal government. Avoiding harm to all creatures… this is true knowledge. All else is ignorance. Meat can never be obtained without injury to living creatures, and injury to sentient beings is detrimental to the attainment of heavenly bliss; let him therefore shun the use of meat. Having well considered the disgusting origin of flesh and the cruelty of fettering and slaying corporeal beings, let him entirely abstain from eating flesh. He who injures harmless creatures from a wish to give himself pleasure, never finds happiness in this life or the next. He who does not seek to cause the sufferings of bonds and death to living creatures, (but) desires the good of all (beings), obtains endless bliss. He who does not injure any (creature) attains without an effort what he thinks of, what he undertakes, and what he fixes his mind on. Nonviolence… and mercy to all life forms are the goals of godly persons who are endowed with My nature. 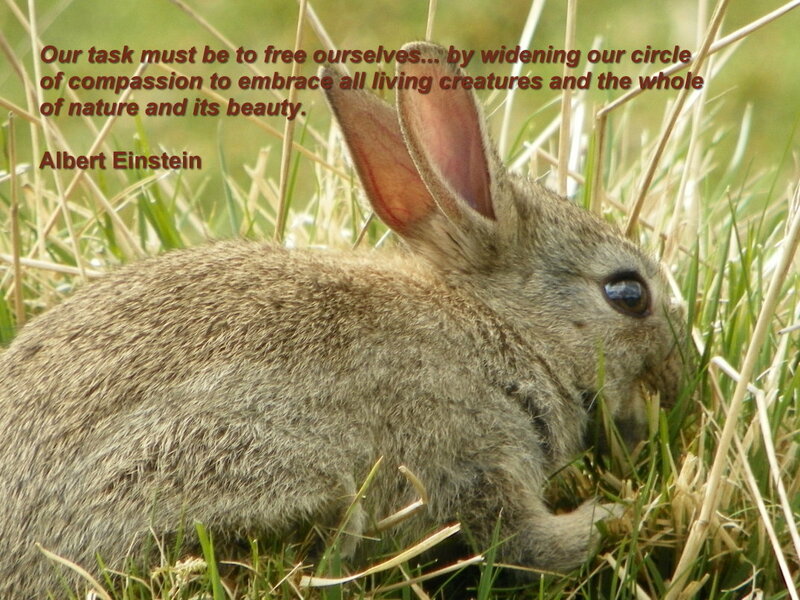 Avoiding harm… and working towards the happiness of all living creatures is the duty of everyone. Ahimsa is not causing pain to any living being at any time through the actions of one’s mind, speech or body. The slaughter of an appalling number of animals–along with the manner in which they are killed–at the Gadhimai festival in Bariyarpur is a horrifying display of violence that runs counter to the Hindu belief in reverence for life. “Ahimsa is not causing pain to any living being at any time through the actions of one’s mind, speech or body”. Hello friends , Next TWEETSTORM (Mon 24th – Sun 30th Nov) this one an extended storm (one week of tweeting) is a little different than the previous ones because there is little time left to stop it in , details as follows and Tweet Sheets futher down post. Please do as many tweets as you can thoughout the week , general guide is 100 a day if you can do more even better, if you cant manage a lot then please do what you can. This I think is now our 5th storm and will be our last before Gadhimai 2014. So lets give it all we got for the animals. WED 26th and THURS 27th = Storming attempt to trend. FRI 28th SAT 29th SUN 30th Report to the world this atrocity if it takes place. The Link above includes instructions on how to make the Tweetstorm effective, ideas, tweet sheets – lots of twitter addresses to send Tweets. Please help by tweeting as often as possible. Did You know that 5 million people will attend this festival. I am shocked that there are so many people willing to watch and participate in such brutality. We have only until November 28th when the massacre of thousands of helpless animals will begin. I may update this blog entry which was written rather quickly as I was not aware of the new Tweetstorm until today. Please take as much action as you can to stop this festival which has no place in a modern society and has nothing to do with mainstream modern Hinduism. Do you dread winter in a cold inadequately or entirely unheated home? Do you think it is wrong that in the sixth richest country in the world 10,000 people should die of the cold because they cannot afford to heat their homes? If the answer is yes than please take the following action. In 2012/2013 10,000 people died from fuel poverty, including thousands of people in London, and we are likely to learn that thousands more died last winter. 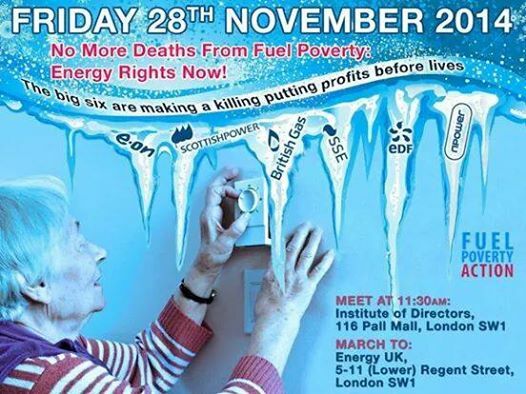 At the same time the Big Six energy companies made £3.7bn in profit – this is equal to £370,000 profit for every person who died. Join and share our facebook event here. There will also be a Pensioner Block meeting at 11am at the main entrance of Charring Cross station, join the facebook event here. Young and old welcome! End Fuel Poverty present similar solutions and call upon the Government and the political parties to commit to the following pledges. 2. Commit to improve the homes of all low income households so that nobody has to live in a dangerously cold and unhealthy home by 2020. 3. Require fuel companies to provide the Warm Home Discount to all low income consumers and vary the rate to reflect the difficulty of heating homes. 4. Make sure all eligible households receive the benefits and tax credits to which they are entitled as part of a wider strategy to tackle poverty. 5. Produce a multi term Fuel Poverty Strategy that sets targets for all relevant (and future) Government departments. The Strategy should also describe how tackling fuel poverty positively affects policies to improve social wellbeing, reduce health inequalities, improve housing affordability, tackle climate change and eliminate child poverty. Though the above would improve the situation, I think more decisive action is required including the re- nationalisation of gas and electricity. While such improvisations as insulation helps if you can afford to turn on your heating, it is absolutely useless if you cannot. Return the distribution of vital fuel to the state. The right to warmth, shelter and food are basic human rights, it is immoral, in fact criminal to profit from vital resources that people need for basic survival. The Government claim that it is already doing enough to protect older people struggling to heat their homes is simply not true, the first thing they did when they came into power was to reduce the winter Fuel Payment by £50 . If what the government say is true why is one older person dying of cold every seven minutes? Pensioners are not the only ones to suffer of course, most of us here in the UK are struggling to pay energy bills some a lot more than others such as the case below. Some British people can’t afford to heat their food. Aren’t we ashamed? I don’t imagine the chief executives of any of the big six called before MPs on Tuesday has ever had to unplug their fridge because they simply can’t afford to run it, or wrap their toddler in a fleece all-in-one and a jumper and a dressing gown of an evening. It wasn’t too long ago myself that I was sitting with my back to my front door, hissing at my toddler to be quiet because there was a man on the other side of it hammering with his fist. I owed Eon £390 in unpaid electricity bills, and they were shouting that they knew I was in there. Every new morning brought red-topped letters, final demands and pairs of men peering through the windows – but as I told them time and again, I couldn’t give them what I didn’t have. I was unemployed, applying for every job that I came across, and mistake after mistake with housing benefit payments meant that I was struggling to get by. The £10 a week food shop has been well documented by now, but I don’t really talk about the Christmas day that I sent my son to his father’s house to spare him the misery of yet another day in a freezing cold flat, with no television to entertain us, no tree, no presents and nothing that even slightly resembled a Christmas dinner. I spent 18 months with the furniture parked in front of the radiators, cooking as quickly as I possibly could to use the least amount of gas and electricity. I unscrewed the lightbulbs in the hallway, unplugged everything at the wall so not even the LCD display was blinking away on the oven. I eventually turned the fridge and freezer off – they were empty anyway – and the boiler, desperate to save money, shocking myself awake in the morning with the shortest, coldest showers, and boiling a kettle of water twice a week to bath my young son. But still, there are some corners that can’t be cut. The clothes still need washing, especially when potty training a toddler. You debate every cup of tea, wonder how much it will really cost, and put another jumper on to try to keep warm. You go to bed when it gets dark in the evenings, because it’s warm in bed and you can’t see anything anyway. No one anywhere in any country in any situation should live like that and there is no reason why they should. It’s all about the greed of the few at the expense of the many and it has to stop. Thousands die of cold each year. In the sixth richest country in the world this is a disgrace. Though my situation maybe not as dire as in the story above and the many similar stories throughout the UK, nonetheless water runs down the wall of the room I am sitting in right now. Black mold makes it’s way up my sitting room wall each winter as a result of inadequate heating. I am tired of struggling to heat my home, paying ever increasingly high prices for an inadequately heated home. Struggling to make cuts , turn the heating on later, have it set increasingly lower, dreading the resulting bill . Basically we get colder each year while our bills get higher. It is impossible to cut back as even if your consumption goes down your bill goes up. Last year it was a mild winter and we did not turn on the heating during much of October yet we were told we need to increase our monthly payments. This year it has been even milder throughout both November and October yet for sure our bill will rise and we will be told we have to pay more. As time goes on we simply will not be able to pay more or reduce our consumption enough to counteract the increase in price. Eventually the only option will be to turn it off! 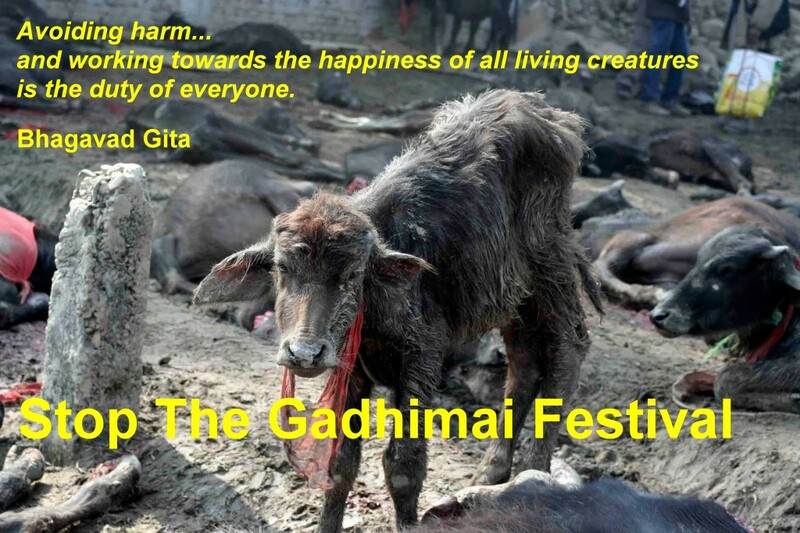 Help bring an end to the Gadhimai festival set to take place November 28th and 29th by joining a Tweetstorm today November 20th. To bring awareness and hopefully Stop the Gadhimai Ritual Slaughter festival in Nepal in November where approx 500,000 animals will be barbarically hacked to death just for a belief . 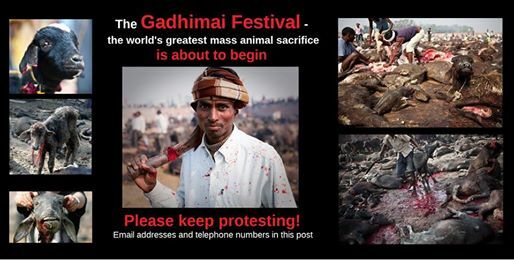 Please use #Gadhimai on every tweet you do . Tweet to celebs ask them to Retweet , they have loads of followers and not many know about this atrocity , so we really need to get the word out . Please invite friends to take part , 500,000 innocent animals lives depend on us to try and Stop this carnage , many animals will not be cleanly killed and will lay dying for the 2 days that this Cruel festival takes place. Please share widely the more people involved the better to make this trend. Please tweet to this former Prime Minister of Nepal and his followers. He seems to be opposed to Gadhimai. At least so it appears from his twitter profile. With only eight days to go we need to take action quickly, it is not too late to send an e-mail to Nepalese government officials or sign petitions or write a letter or e-mail to the Nepalese embassy in your country. Warning: The attached video footage contains images that some may find shocking. This is my third post about the Gadhimai Festival. I find this festival deeply disturbing on just so many levels, not the least of which are the suffering of the animals concerned and the exposure of children to this sickening cruelty. 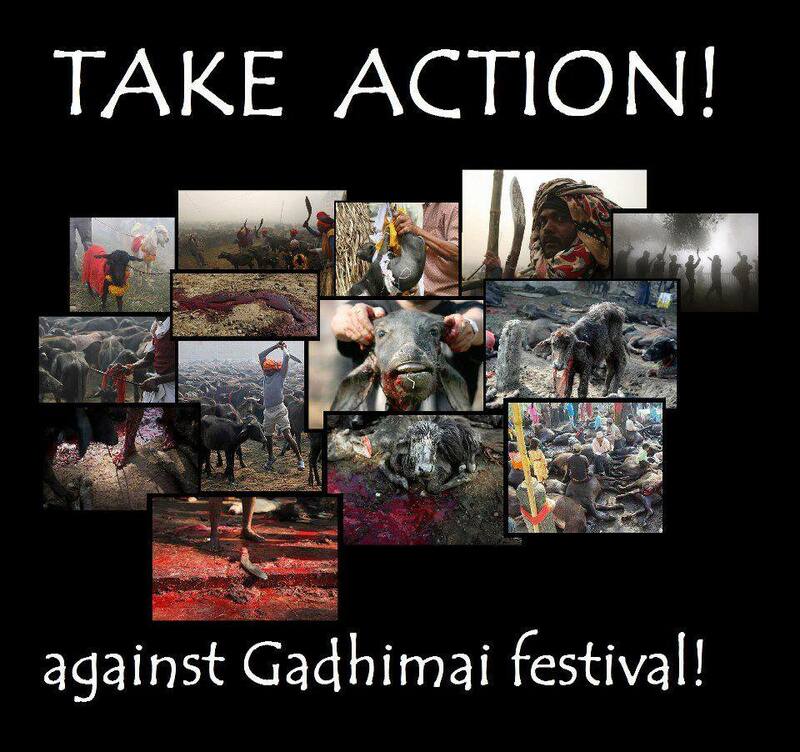 If you can please tweet ‪#‎Gadhimai‬ at least 5 to 10 times every day until the next tweetstorm. It will keep the hashtag in circulation and bring attention. Also, please reach out to people in twitter (even if you don’t know them) especially vegans and people involved in other animal rights/environment causes and tell them about #Gadhimai so the hashtag starts to circulate as much as possible. Please take the above actions even if you have taken previous similar actions. I have signed many petitions and have written to Nepalese government officials, however it certainly does no harm to sign as many petitions and send on-line messages that are available. Every action counts in the effort to bring an end to this cruelty. Included in the above links you will find more petitions and other actions you can take to help stop this cruel festival. I warn you it is incredibly distressing, I admit I can’t finish watching it and if you are a sensitive person I would not recommend you doing so. The horror of the horrendous brutality and inhumanity from a time we had thought long past is difficult even to read about. Please sign the petition by clicking the link below the video if you have not already done so. This is a simple petition requiring only a few details. Every five years, the month-long Gadhimai festival is held in southern Nepal to honor the Hindu goddess of power, Gadhimai. Approximately 500,000 animals are brutally slaughtered, making this the world’s largest sacrifice of animals. 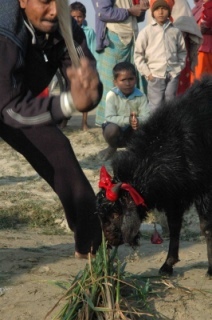 Many Nepalese do not even participate in the Gadhimai festival slaughter. A large number of participants are from India, where killing animals for religious sacrifice is already largely discouraged. The majority of festival attendees come from neighboring India—the birthplace of Hinduism—where grotesque animal sacrifices are rightfully largely discouraged. The very concept of taking a being’s life in exchange for blessings contradicts the Hindu philosophy of ahimsa, or harmlessness. In fact, many Hindus believe that animal sacrifice is forbidden by the doctrine of ahimsa. Abusing animals also harms society as a whole. It normalizes killing and desensitizes children—who watch men hack at and decapitate animals—to the suffering of other living beings. Animal rights activists in Nepal and elsewhere have begun a campaign to end mass sacrifice of animals and birds at Gadhimai Mela to be held next month in the southern plains of the country. Billed as the biggest animal sacrifice fair in the world, the fair is held every five years and nearly 500,000 goats, male buffaloes, pigs, chickens, pigeons, ducks and white mice are sacrificed within two days. On Saturday, animal rights activists held a rally in Kathmandu to protest against this practice to be held on November 28 and 29 at Gadhimai Temple located in Bariyarpur of Bara district close to the Indian border. Hundreds gathered outside the Bhadrakali temple and marched till Basantapur Darbar Square where they formed a lotus — the symbol to end animal sacrifice. At the end of the day it does not matter who is or is not to blame it is the animals that matter, this festival must be stopped now and forever. The government of Nepal should be ashamed, this cruelty has no place in any modern day society any more than any other cruelty to animals. There is no excuse whether it be tradition, religion or profit motivated by common greed. Please sign the above petition and take as many of the suggested actions as you can.